Nigeria is said to be an evil entity built on the foundation of lies and deceit, where Justice is pronounced dead on any attempt of arrival. There is no active supreme law in Nigeria today which will be solely superior for the defence of one's freedom and individual human rights, these has been one of the major reasons Nigeria was among the world's most corrupted and evil countries. The Nigeria corrupts leaders had unconditionaly detained Mmadubugwu and Nnwanwuisi for almost 3(three) years now and access to better medical checkup has already been denied to them. How can somebody who is oppressed, tortured, starved and barely get fed, be detained for nearly three years without access to standard medical treatments? Instead they force them into using the low equipped prison clinic. This act simply proves that Nigeria is not only a contraption, but a ZOO where human beings are maltreated like wild animals. The Nigeria Prison Services do not only detain and torture Mmadubugwu, but he was teargassed alongside with Nnamdi Kanu when the leader of the Indigenous People of Biafra Mazi Nnamdi Kanu was still with them. Ever since they were teargassed, Mmadubugwu's health issue has worsened to the extent that he is likely to die at any moment from now as he is suffering from ASTHMA which he was subjected to as a result of the teargas. 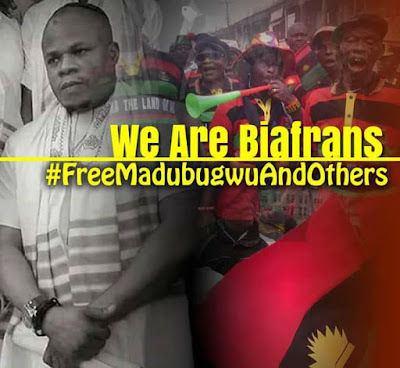 Even though we had been receiving information from a source close to him at the Kuje prison since Nnamdi Kanu was released on stringent bail terms; that we the Biafrans might end up losing Mmadubugwu to death at the hands of the Nigeria government. We(Family Writers Press) were able to confirm this when one of our correspondent visited him at the prison. He confirmed that Mmadubugwu fell down and collapsed which he nearly as a result of improper medical care from the asthmatic infection caused on him by the Nigeria DSS at the prison Dungeon. He was immediately rushed to the prison clinic for further treatment. But, lets put some key facts into consideration to figure out some things. Recall that, Mmadubugwu and Nnwanwuisi were arrested and detained with the only crime of being the engineers constructing and installing Radio Biafra satellites before Nnamdi Kanu was also arrested and detained together with them. On three different occasions they have been granted bail unconditionally alongside Kanu, but instead, the Nigeria government under President Muhammadu Buhari disobeyed the court orders which they went ahead and pronounced the bail grants as null and void and still detained them. They were teargassed in two different occasions, yet medical access for better treatment has been denied. It's seems the Nigeria government wants them to die. Masked witnesses and the introduction of sharia law was brought in an attempt of hawking for proves to execute and terminate these prisoners of conscience. Even when Binta Nyako made the Federal High Court her own personal asset, while she has constantly tried to play with the written script handed to her by Buhari and his northern cabals. DO YOU THINK THAT MMADUBUGWU WOULD BE GIVEN THE RIGHT TREATMENT AT THE KUJE PRISON CLINIC? Remember that they purposely teargassed, starved, tortured and poisoned him in a bid to kill him. The best treatment to regain his health will never be rendered to him at the Nigeria Kuje prison clinic in Abuja since all they are doing is to terminate the life of this young Biafran. He studied engineering as a course in college. So he's no criminal. IPOB is a legal body worldwide, Radio Biafra London both home and abroad is not illegal therefore Madubugwu) should be released. Nnamdi Kanu was released based on health conditions as stated by the Chief justice of the Nigeria Federal High Court Abuja even when Nnamdi Kanu did not complain or slump to the ground. We hereby, demand that mr Mmadubugwu and other Biafrans detained unlawfully should be released now with immediate effect because we shall retaliate until Nigeria is destroyed totally if anything should happen to them.